RubiStar - A tool to help the teacher who wants to use rubrics but does not have the time to develop them from scratch. 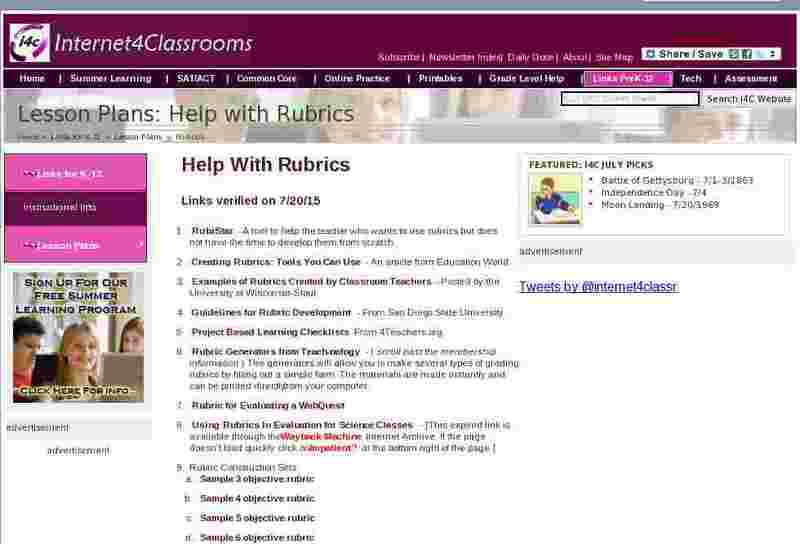 Creating Rubrics: Tools You Can Use - An article from Education World. Examples of Rubrics Created by Classroom Teachers - Posted by the University of Wisconsin-Stout. Guidelines for Rubric Development - From San Diego State University. Project Based Learning Checklists From 4Teachers.org. Rubric Generators from Teach-nology - ( scroll past the membership information ) The generators will allow you to make several types of grading rubrics by filling out a simple form. The materials are made instantly and can be printed directly from your computer.